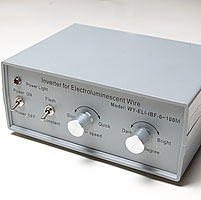 110/220 Volt Inverter runs 150-328 feet of EL Wire. This inverter features a variable flash rate or constant operation and a brightness control (dimmer), and runs 150-328 feet of EL Wire. Includes male/female connector set. Fan cooled for heavy duty use. This unit is designed for 110/220 volt use. You might need a plug adapter for your country.